Each artist succeeds in bringing out the beauty they find in the clay and creating something organically expressive, timeless, and yet totally of the moment. Explore how a beloved Japanese tradition is being reinterpreted and inherited in the United States at the JICC’s “Floating Islands: Ceramic Ikebana Vessels” exhibition, presented together with the District Clay Center and Ikebana International, Washington, D.C., Chapter No.1, and sponsored by Marymount University. Curated by renowned ceramist Akira Satake, this exhibition features ceramic ikebana vessels created by some of the most talented potters working within the U.S. today, several of which have lived and studied in pottery towns in Japan such as Bizen, Mashiko, and Shigaraki, where they were able to hone their art and bring back methods of making and firing to the United States. All featured potters, including special guest artist, Japanese Master Potter Ken Matsuzaki, share an innate sense of the importance of ma, or “negative space,” a concept integral to Japanese aesthetics. Exhibition panels will allow visitors to gain insight into the various traditional techniques of ceramics native to Japan, as well as the principles standard to the schools of Ikebana. Artist statements on display will also invite viewers to explore the unique ways each ceramic artist took inspiration from traditional Japanese aesthetics and evolved it to a personal style. 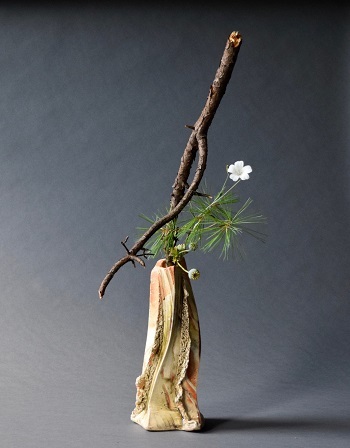 Additionally, three Ikebana Artists from Ikebana International Washington D.C. Chapter No.1 will exhibit arrangements inspired by and featuring three of the exhibited vessels. In celebration of this event, we are hosting an Ikebana Drawing Contest. For more information and how to enter, please click here. About the Title, “Floating Islands: Ceramic Ikebana Vessels” || Each ikebana arrangement is an island – a complete and perfect world unto itself that is floating on its ceramic vessel. This idea comes from Ikebana’s objective to distill the outside world, particularly the natural landscape, down to a simple, but perfectly balanced piece of art that can be contemplated indoors. The title is also reminiscent of the “floating world” of Ukiyo-e. This exhibit will move to the District Clay Gallery on September 29th and will be on display at District Clay Gallery from September 29th to October 31st. Ikebana International is a non-profit, cultural organization dedicated to the promotion and appreciation of Ikebana, the Japanese art of flower arrangement. The late Ellen Gordon Allen founded the organization in 1956 to promote friendship among the peoples in the world through their mutual love of nature and enjoyment of ikebana. Today, there are 161 chapters of Ikebana International in over 50 countries, with a membership of approximately 7,600 people. The Washington, D.C. Chapter is proud to be the first chapter (Chapter No. 1) of Ikebana International outside of Japan, with a membership of over 240 dedicated individuals, including many talented instructors. . The District Clay Center is the largest ceramic facility in Washington D.C. with 20 weekly community classes, master artist workshops, artist talks, and clay intensives. It includes artist space for 44 ceramic artists and offers one-year residences for three emerging ceramic artists. It was recently listed by Artsy as one of the Best Places to Take Ceramic Classes Across the United States.The District Clay Gallery is Washington D.C.’s only all-ceramic gallery and is located within the District Clay Center. The gallery presents six exhibitions a year, including shows highlighting new emerging artists, important political and social themes, and exceptional ceramic art. Marymount University was founded in 1950 by the Religious of the Sacred Heart of Mary (RSHM). Marymount University is a private, Catholic university offering bachelor’s, master’s, and doctoral degrees in a wide range of high-demand disciplines. A comprehensive co-educational institution, the University uses three pillars as a foundational mission by which to enlighten and edify students: intellectual curiosity, global perspective, and service to others. Marymount educates citizen-leaders who bring clear minds, ready hands and full hearts to shape a better world, ensuring that each student graduates with the experience of at least one internship and a broad array of study abroad opportunities. The exhibition is free and open to the public. The exhibition will run from August 27 through September 27 and will be open to the public during regular JICC hours, 9 AM to 5 PM, Monday through Friday. The JICC will be closed on September 3 in observance of Labor Day.